One of the most popular pens on the market today is the Pilot Vanishing Point. Its origins go back more than 50 years, and this genuinely rare limited edition pen celebrates that anniversary. Number 691 of only 900 pens, the Pilot Capless 50th Anniversary pen is made of Itaya maple wood! It is the first Pilot Vanishing Point to be made of wood. It rests in a box made of maple, too. 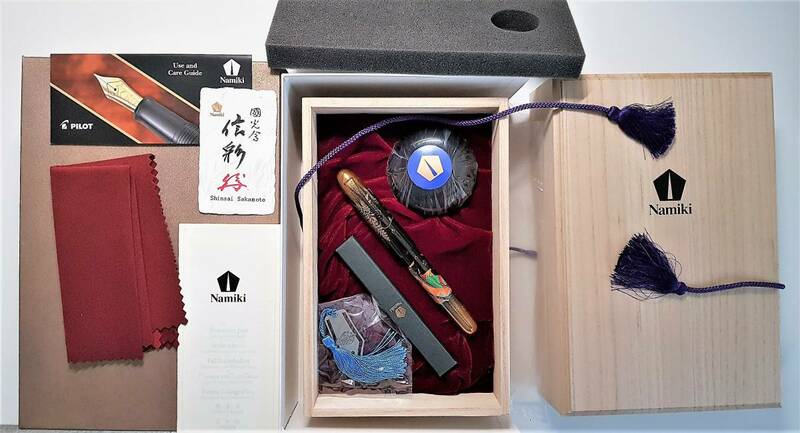 It comes complete with cartridges and a converter, as well as papers, including a brief history of Pilot/Namiki's capless fountain pens. The box and pen numbers match. We are certain the pen has never been inked, and the rest of the pen's condition is flawless. Without testing it, its nib is 18k gold and marked "F" for fine. 14.1cm retracted. Pilot Ecrino pens are just darn good, all 'round everyday pens. Handsome in blue with golden trim, it is a click pen that just doesn't give up. Our is in good shape with minimal wear and a working black refill. The refill is a proprietary Pilot BRF-20. Light weight with a nice width and grip. 13cm. Almost New Old Stock, this is a prized mustard yellow Pilot Vanishing Point fountain pen. It comes complete with its box and papers. It looks as if someone engaged the cartridge it came with, and that is all the ink it has seen. We flushed it with a sonic cleaning. The only think missing is the converter, but it does have that little metal cartridge cover. The gold nib is marked fine, but it writes like an extra-fine razor blade. 14cm.